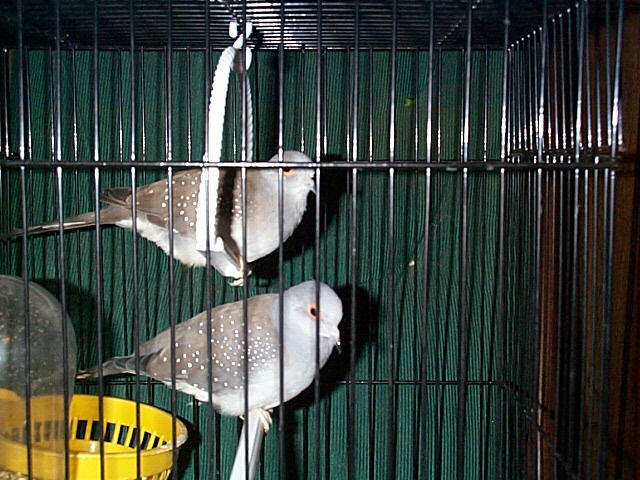 I currently only have one pair of Starlight Doves. They are small birds, just slightly larger than a finch, but with all the qualities of the larger dove species. I really enjoy having them, their calls are so soothing. Starlight Doves are beautiful birds, grey and brown with small white markings on their wings, that look like stars, hence the name. They have orange rings around their eyes, the males rings are brighter than the females. The male is so cute when he displays for the female, he bows to her, fans his tail, and coo's to her... it is so adorable. Mine have laid four clutches of eggs so far, but haven't hatched a brood as of yet. They lay an average of two to four eggs and they take turns setting on them.